The iQ is one of Toyota's new model launches in 2009. Toyota Europe says it will bounce back in 2009 after its new-car sales fell 10 percent to 1,119,521 in 2008, compared with the year before. Toyota Europe CEO Tadashi Arashima said the company expected that 2008 would be a difficult year for Toyota and Lexus because the brands had fewer model launches. This, coupled with global market upheaval, significantly impacted our sales volume and production levels, Arashima said. Arashima said Toyota expected a tough year ahead in Europe but he promised the automaker would increase its market share through a product offensive of 12 new Toyota and four new Lexus models. Toyotas European market share dropped 0.3 percentage points last year to 5.3 percent. 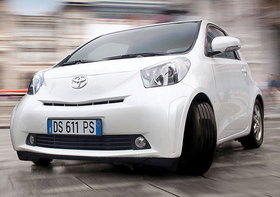 Toyota Europe aims to boost its market share by 0.7 percentage points to 6.0 percent in 2009. Sales of Toyota cars in its European markets were down 9 percent to 1,074,281 in 2008 while sales of Lexus models plunged 16 percent to 45,240. Arashima said the companys new models will be fuel efficient and will help ensure that Toyotas fleet-average CO2 emissions in Europe will fall below 140 grams per kilometer in 2009. Some good news for Toyota was that combined Toyota and Lexus hybrid sales increased 18 percent to 57,819 in 2008. Sales of the Prius were up 29 percent to 41,495. The Yaris small-segment car was Toyotas best seller in Europe last year, although its sales fell 10 percent to 239,155 vehicles.